Muffins that taste like a breakfast cake but much quicker and easier to make! Reheat these in the oven or microwave for that “fresh from the oven” taste. Mix together all your dry ingredients in a very large bowl. Stir together wet ingredients and add to dry ingredients. 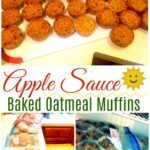 Scoop mixture into greased muffin tins or use muffin papers. To serve, thaw overnight and enjoy!